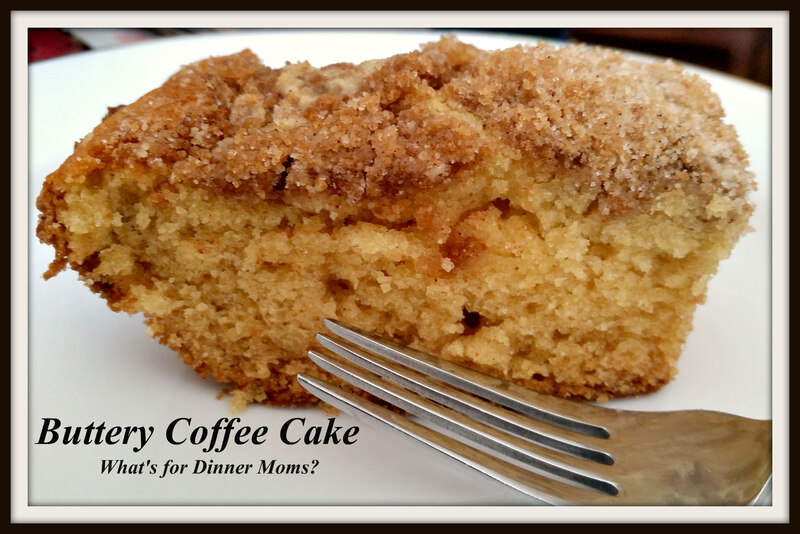 Buttery Coffee Cake – What's for Dinner Moms? Looking for something to brighten up your weekday breakfasts or Sunday brunch? For the most post we are not big breakfast eaters. Once in a while we will do a big breakfast on the weekend but during the week my son is really the only person that eats breakfast. Usually it is cereal or oatmeal. He love breakfast sandwiches too. But, we LOVE a good coffee cake. I love a soft buttery cake with lots of crumbly topping. This past weekend we set out to make a coffee cake that would fulfill those requirements. This was a hit! I just ate the last, tiniest bite for breakfast this morning. The family had most of it gone in one day. Usually they pick the topping off the cake because that is where all the good flavors are but this one they ate the cake too because it was so delicious! I wish I had a better picture that could show you how tender the cake was and how light and fluffy it was. It is really a very simple cake to make too. Don’t have buttermilk on hand? Use one tablespoon vinegar with a scant cup of whole milk or half and half. Preheat oven to 350 degrees. Spray an 8 x 8 baking pan with non stick spray. Combine flour, sugar and salt together in a large bowl. Mix until well combined. Cut in the butter until it resembles sand. Remove 1 cup and 1 Tablespoon and set aside for the topping. Mix in buttermilk, egg, vanilla, baking soda and baking powder with a mixer. Batter will be very thick. Beat for 2-3 minutes until it resembles very smooth frosting. Add brown sugar and cinnamon to the reserve mixture. Mix well. Sprinkle crumbs over the batter pressing down lightly. Bake cake 50-55 minutes until center is set. Remove cake from oven and allow to cool before serving. This looks delicious. I’m going to need to make this for my whole family. What a great thing to take when we visit for holidays too! Haha, this won’t last long with my family 🙂 Sounds delicious ! Lol. I could too! I got the last little dried out corner this morning and still thought it tasted good. I’ll have two pieces please! It’s yummy! I was happy there was just one little slice this morning or I may have finished the whole pan! Sure! My email is koolaidmoms@gmail.com. Let me know when and I will see if I can make it work. Just what I was looking for for this Sunday’s breakfast! Looks incredible, Marci! Thanks!